Nigel Gifford OBE has fed some of the world’s elite adventurers in the most remote and inhospitable places on earth, including the death zone of Mt Everest and above. In the early 1990’s Nigel designed a special camera platform for the first ever hot air balloon flight at 33,000ft over Mt Everest and worked on Sir Richard Branson’s round the world project, advising on the small capsule’s internal layout and feeding the crew confined inside. Nigel has also had his own extraordinary adventures as a climber and skydiver with over 1000 free fall descents, making and breaking several world records. Developing from the experiences and skill set learnt from expeditions and adventure, Nigel took to the entrepreneurial world with the same appetite for risk and reward. He was the entrepreneur who brought the (now multimillion dollar) Merrell Outdoor Footwear to the UK and Europe, and was the first mountaineering consultant for Rohan Designs and 3Ms Thinsulate division. Unfortunately, Nigel's business was caught up in the financial crisis and went into liquidation. Determined to rebuild his business life and succeed again Nigel turned to his roots in aerospace adventure, dusted himself off, and started again. His drive in business, as in innovation in expeditions, is renowned. Nigel is part of the revolutionary team who created Ascenta™, considered one of the most advanced steps in highly effective low cost aerospace robotics today. The latest in a long line of acquisitions by Facebook, Ascenta™, renamed to Project Aquila, morphed into a larger airframe as the core technology for Facebook’s unmanned solar powered airborne initiative to stretch internet access to remote regions and developing countries through the internet.org connectivity programme, launched by Mark Zuckerberg in March 2014. Nigel is able to take you on the truly fascinating journey of how developing the Ascenta™ platform was managed and brought to the market. This is a wonderful story of the people involved with Ascenta™, its capabilities, and the phenomenal journey that Ascenta™ undertook from its humble beginnings on a farm in Somerset to the stratospherical heights it has now reached. 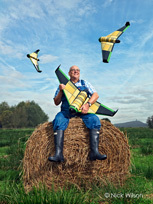 In 2016 Windhorse Aerospace was formulised and the British logistics expert and entrepreneur Nigel's latest project 'Pouncer™' started taking ethical technology to a new dimension as his edible drone can deliver food relief in the immediate aftermath of a complex humanitarian crisis, and is designed to be released from a cargo plane to within twenty-three feet of its target. Iron Maiden member and entrepreneur Bruce Dickinson is now involved with Windhorse. "While unpacking one and a half metric tons of food, you make yourself a very nice sniper target...so I said to the commander, 'I wouldn't do that. I would build the aircraft out of food.'" Nigel explains the power of disruptive technologies and how his own work and inventions can play important roles in human connectivity, economic development, food security, early weather warnings, crop production and monitoring - in ways that are likely to change the face of the industry. *‘Skunk works’ is a term widely used in business, engineering, and some technical fields to describe a group of people with a high degree of autonomy who are unhampered by bureaucracy, and work on critical, advanced or secret projects. Publications: The Adventurous Traveller; Royal Geographical Society’s Handbook on Expedition Catering. Nigel has also contributed to the book Dyslexia and Us alongside Sir Steve Redgrave, Baroness Mone of Mayfair and many other celebrities. Nigel and I work together in the agile aerospace sector of “Drones for Good.” Within twenty mintues of meeting him, I knew I wanted to be part of his vision to deliver food from the skies to relieve desperate people surviving global disasters and horrendous conflicts with his Pouncer™ HUM-AV. For some time I thought he was a career aerospace engineer in his sixties. What I didn’t know then was what a ram packed roller coaster life he has actually led ~ 11 years in the British army, seasoned big wall climber and Everest mountaineer; top ranking skydiver with over a thousand freefall descents, Founder of Himalayan Skydiving, AND a professional executive chef who has also fed members of the Royalty, a plethora of VIPs, and some of the world’s top explorers in every non-human environment. 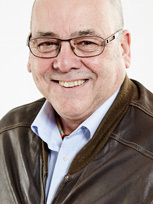 He’s also had an exceptional career as an entrepreneur successfully launching and sometimes loosing, several greenfield businesses. Nigel established Merrell Outdoor Footwear from an unknown product to being the leading brand in UK and Europe in 18 months using marketing techniques that were audacious at the time. Here’s a ‘silver surfer’ man of energy, enthusiasm vision and innovation carved out of hardened determination and raucous humour that lost everything aged sixty three in the 2008 financial crash, and didn’t give up. Nigel has some outstanding hair raising and funny life lessons to tell. Nigel's presentation on the background, development stages and route to market of the innovative solar powered high altitude unmanned aircraft, Ascenta, was absolutely brilliant. The Satellite Applications Catapult team at Harwell, and the invited audience were enthused, motivated and appreciative of him sharing his experiences and knowledge. This was a tale of innovation and dogged determination by a small British team who quietly took on the Goliaths of the aerospace industry with agility and by thinking outside of the box. We are delighted to have engaged with Nigel and have no doubt that our emerging high tech companies will benefit from his commercial and other skills to the future of sUAVs, pseudo satellites and robotics.